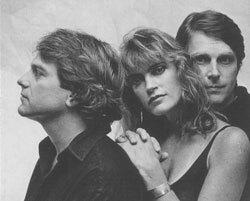 .. For thirty years these three talented singer songwriters from Maine and New Hampshire (Alana MacDonald , Tom Dean, Herb Ludwig) toured the US and Europe as well as releasing five CD’s. From the pubs and folk stages of the Northeast, this singer-songwriter trio developed a devoted fan base that has followed these three musicians from coast to coast to hear their shimmering three part harmonies and award winning songs. They were commonly referred to as the #1 vocal group on the contemporary-folk music circuit. ..”Industrial Twilight” the band’s 5th release is a musical and lyrical journey down the yellow brick road. With it’s Beat influenced lyrics and unique instrumentation this CD reached new creative heights for Devonsquare. ..From the folk clubs in the sixties and seventies to the major label debut in 1988 on Atlantic Records, this group known for their exceptional songwriting and stunning vocal harmonies never stopped growing. ..Sadly in 2005, founding member Herb Ludwig passed unexpectedly during a heart operation. His songwriting, beautiful tenor voice and soaring falsetto were an integral part of that heavenly Devonsquare vocal sound. 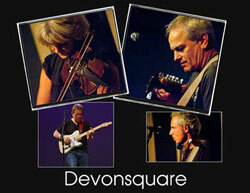 After a number of years has passed the two remaining members, Tom Dean & Alana MacDonald decided to perform again as Devonsquare, joined by longtime bass guitarist Teg Glendon and guitarist Robby Coffin. On the 30th anniversary of the Atlantic Records release of “Walking On Ice”, Devonsquare has decided this will be our last year of live performances. 1984 – Release of the band’s 1st full length recording title “Devon2”. 1986 – Release of “Night Sail”, the band’s 2nd release. 1988 – Atlantic Records signs the songwriting trio to a 2 record deal and re-releases “Walking On Ice” internationally. 1989 – Pony Canyon Records in Japan releases “Night Sail”, a compilation of the first two recordings by Devonsquare. 1992 – “Bye Bye Route 66” is released internationally on Atlantic Records. 2018 – Two SRO shows at Stone Mountain Arts Center in Brownfield, Maine to celebrate the 30th anniversary of the release of Walking On Ice” by Atlantic Records and also the final live performances after 43 years.